Given the focus on the U.S. election -- a topic that I prefer to avoid commenting on -- I am keeping this article brief. I just wanted to post a couple charts on the U.S. labour market. I see little sign of any form of overheating, but a rate hike in December seems to be in the cards. The only question is when any follow up rate hikes will happen; September-December 2017 is probably the best bet (in the absence of a recession). The employment-to-population ratio (above) has stalled out in March, although in retrospect that surge may have just been noise on top of the underlying trend. 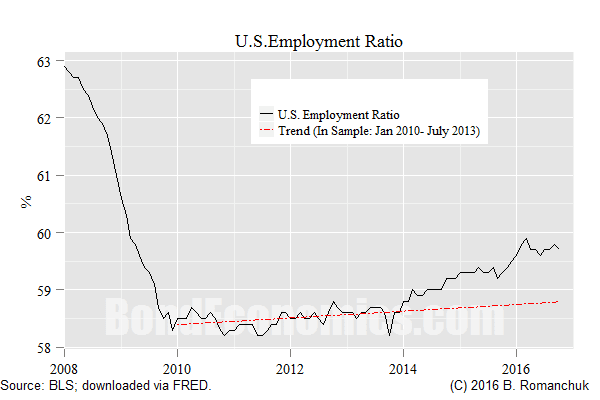 In any event, the employment-to-population ratio is well below the level of the previous cycle. Wider measures of the labour market also indicate we are far from overheating. For example, the "Labor Market Conditions Index" has stopped rising (the chart above shows the one-month change in the index). I discussed the index in this article; my argument was that the index construction method appears reasonable, but the problem is that the U.S. labour market is segmented. Some professions are doing well, and there are less available workers, but there is considerable softness in the lower skill segments. It is difficult for a single indicator to capture such diverging trends. Brian, consider your moment of death and what goes through your mind then. You really want to be the guy who chose not to comment on the US election? You are more focused on the wisdom of accounting identities and keeping discussions of money out of macroeconomics. I knew you when you were young. And enjoyed your company. Aim higher, bro. I am also not particularly concerned about the presidency; the US is supposed to be a republic, not a monarchy. I realise that has been slipping in recent decades, but my reading of the situation is that Congress will end up Republican controlled, and is not going to roll over for either candidate. Ran some tests. The LMCI provides no additional information to simply taking the first difference of the unemployment rate. Makes no difference to the above argument. Just an FYI.